I BLESS YOU. WITHIN MY WOUNDS I HOLD EACH PERSON IN ORDER TO MAKE THEM PARTICIPANTS IN MY LOVE. My People maintain their faith in Me, so they will continue standing without faltering or being distracted by those who wish to contaminate them with false doctrines or unhealthy liberal concepts that are the property of the devil. My People are a People of victory who walk in compliance with the Divine Law, discerning and saying “no!” to what is contrary to Our Divine Will. My children are surprised by the attacks of the devil who overtakes them, striking them fiercely where he can produce more scandal in order to make a greater impact. My Church is experiencing instants of uncertainty, being scourged, having neglected since time ago – some of My consecrated – unity with Our House, and having become disproportionately entangled with the affairs of the world, neglecting their obligation of shepherding My Flock, In the face of which the faith of some of My children is shaken due to lack of love towards Our Sacrosanct Trinity and towards My Most Blessed Mother. HUMANITY HAS NOT PAUSED TO MEDITATE ON THIS INSTANT OF TRANSFORMATION OF WHICH I HAVE BEEN WARNING YOU, because you go through life by inertia, you have not learned to think or reason, you live without looking ahead nor to the side, due to a terrible submission to everything that facilitates coexistence on Earth without the slightest effort. Therefore, it is comfortable and easy for the devil to draw My children towards what is sinful and to what I as Your God abhor. Humanity constantly lives with the arrogance within which the struggle of powers occurs, generating the pride with which My children forget Me and forget the Requests of My Mother, devoting themselves to showing off especially what is material, within an “ego” inflated by material possessions. I COME TO EACH ONE OF YOU LIKE A BEGGAR TO PLEAD FOR WHAT IS MINE AND WHICH I GAVE YOU TO ADMINISTER, but you have not been good administrators and have taken possession of what I gave you, refusing to listen to My Word, My Calls and the urgent Requests of My Mother so that you come out of your misery and save your soul. YOU CONTINUE BEING SPIRITUALLY LUKEWARM, RUBBING UP AGAINST EVIL AND RESORTING TO ME WHEN YOU ARE DOWNCAST, TIRED OR AFFLICTED, BUT YOU LOOK AT ME FROM AFAR IN ORDER NOT TO DETACH YOURSELVES COMPLETELY FROM WHAT IS WORLDLY AND SINFUL. My beloved People, commence going in the direction of fraternity; those who live comfortably in this instant, will come to be welcomed by some of their brothers and sisters whom they despise at this instant or view with distrust. Those who in the eyes of the world seem devoid of intellect are some of those whom I have chosen to send My Word and that of My Mother in this precise instant when the hordes of evil are everywhere scourging Humanity, deaf and absorbed in sin. MY PEOPLE SHOULD ASSIST ONE ANOTHER, BEING UNITED SO THAT EVIL DOES NOT BRING THEM DOWN, BUT GREED HAS TAKEN HOLD OF MAN SO THAT HE FEELS LIKE A KING AND LORD AND DESPISE THE NEEDY, FORGETTING THAT THE ONE YOU REGARD AS NEEDY MAY OWN MY HEART AND RECEIVE MY ETERNAL GOODS. My children, Heaven labors tirelessly, moving hardened hearts and minds gone astray, minds obsessed by evil and given over to the depraved desires that I abhor (cf. Prov 6,16-17). My House labors tirelessly so that thoughts do not prevent man from being obedient to My Requests and refusing sin. My People need to react and not depend on the way of the world; My People must be faithful to My urgent Calls, faced with a Humanity that is constantly fighting against itself. The constant innovations presented to you by evil are leading you to the worst moral decay of all periods in the history of mankind. My People, I have called you to rectify the wrong work and action due to which you mock Me. The human being will taste the bitter cup of justice, finding itself facing what it has generated for itself. YOU ARE LIVING INSTANTS IN WHICH MY MERCY REMAINS ATTENTIVE TO ALL THOSE WHO WITH A SINCERE HEART SEEK ME IN ORDER TO AMEND THEIR PATH, AND WITH SADNESS I RECEIVE THE REJECTION OF MY CHILDREN WHO, SUBJECT TO EVIL, HAVE DEVOTED THEMSELVES TO SOWING SIN IN THE WEAK, THE LITTLE AND THE MOST FRAGILE. Hypocrites the ones who mock Me by praying in haste in order to rush off to meet with sin. I AM NOT THE GOD OF THE DEAD, BUT OF THE LIVING. ALL THE ABOVE IS NOT A FANTASY BUT MY TRUTH, BECAUSE I DO NOT ACT WITHOUT WARNING MY PEOPLE (cf. Am 3.7). My beloved People, how much suffering because of refusing to live within the Divine Law! You deny everything that I tell you in order to continue with unbridled licentiousness. Your travelling companions, your guardians, suffer the unspeakable because of man’s behavior on the path of perdition. The nations are suffering the least: the true purification will begin and the human creature will lament to the end over its bad behavior and disobedience. My People, do not neglect the praxis of prayer, be constant in your works and acts. The Earth continues its fierce shaking in one country or another, therefore prayer for one another is necessary – do not forget Chile, Japan and Mexico. Do not forget prayer for countries invaded and persecuted by communism and by minds manipulated and driven mad by the desire for world power, which will lead Humanity to war. The Earth will shake to such a degree that some of My poor children will call Me desperately, without loving or obeying Me. They are dry hearts like the fig tree. My People, I carry you in My Heart. I bless you and I love you so much as I do not want anyone to be lost. UNITE! YOU CANNOT WALK ALONE, UNITE! DO NOT FEAR, I COVER YOU WITH MY LOVE; BE TRUE. CHILDREN, RECEIVE MY LOVE AND MY CONSTANT ASSISTANCE FOR EACH ONE OF YOU. My Heart desires that you free yourselves from the chains to which you remain tied so that in this way you begin the change to your life that each person requires, and therefore spiritual change. Waiting for signs in the sky in order to repent is not right; you do not know if those same signs that you will see will cause you to lose your sanity because of not having lived anything similar before. You continue your lives and daily action within society, work and the tasks with which each one of you has been involved and to which you are committed; some continue in their desire to be better each instant in order to remain within the Trinitarian Will, discarding everything that can lead them to sin – others continue to make God wait and others renounce God. THIS IS NOT THE INSTANT FOR YOU TO FORGET THE CALLS OF MY SON AND OF THIS MOTHER; IF PREVIOUSLY I HAVE CALLED YOU NOT TO FORGET THE REVELATIONS, AT THIS INSTANT I INSIST THAT YOU KEEP THEM IN MIND MORE THAN BEFORE. How much we have begged you to change your lives, since you believe that everything is a utopia and that nothing is going to happen ! But this is not so, children, it is the great Mercy of My Son who, knowing the influence of evil on this generation, has insisted on rescuing the greatest number of souls. Heaven is acting, yes, calling so that you are not distracted, calling so that you do not go astray, calling you to stay awake (Mt 26,41), since even those who are awake let great signs pass unnoticed that mark the course of events for you. THE SON OF PERVERSION MOVES ON EARTH AND IS DELIGHTED TO SEE MY CHILDREN ATTACKING ONE ANOTHER. THE ANTICHRIST IS ON EARTH EXERCISING HIS EVIL POWER FROM THE HIGHEST SPHERES IN ALL ASPECTS THAT CONCERN MAN, FROM WHERE HE EXERCISES HIS COMMAND, TO WHICH THE GREAT MAJORITY OF INTERNATIONAL ORGANIZATIONS HAVE ALREADY BEEN SUBJECTED, ESPECIALLY IN THE ECONOMY FROM WHERE HE MAKES COUNTRIES BOW. The Earth is suffering great transformations from within; for this reason you are continually experiencing earthquakes. I want you to be aware that besides this force specific to the Earth, some countries are shaken by forces coming from man’s misuse of science, and because of misuse in this regard, the instant will come when man will be unable to control the force that he is exerting on the Earth and will cause an unprecedented disaster in some countries. Nature will once again tell man that he cannot compete with its force; Mexico will suffer, and I ask you to pray for this country, as well as for Los Angeles, California, and for the rest of America. As Mother I call you to pray with your heart and voluntarily transform yourselves into true children of My Son at this instant when a large number of your brothers and sisters are apostatizing from the faith. IN THE SPIRITUAL BATTLE BETWEEN GOOD AND EVIL, SOME OF MY CHILDREN ARE NOT CONSTANT IN ACTING AND WORKING IN GOODNESS, THEY ARE GOING BACK TO BEING LUKEWARM DUE TO A LACK OF DEVOTION; OTHERS THROW THEMSELVES INTO THE HANDS OF THE DEVIL, WHO INJECTS THEM WITH DEPRAVITY, LACK OF FAITH AND LICENTIOUSNESS. Beloved children, whoever accepts evil and embraces the devil as their god is adhering to the tentacles of the infernal dragon, giving him strength to act against your own family members; whoever allies themselves with evil may become their own family’s executioner – evil has no compassion, knows no compassion. I call you to pray with your heart so that this balm of Love, the fruit of prayer, reaches where it is needed. Some islands of Oceania shake and suffer, pray for this intention. 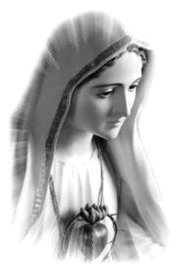 Beloved children of My Immaculate Heart: the People of My Son must emanate fraternity towards their fellow men, love towards the Most Holy Trinity; they must be fulfillers of God’s Law and strengthen their faith in Divine Power, in Divine Omnipotence, in Divine Omnipresence at these instants when My Son’s People, of whom I am the Mother, are being shaken by the darkness that had remained hidden within the Church of My Son. Man has changed his actions, acts and reactions, and violence is taking over Humanity; the sun emits its vibration with greater force and alters man’s psyche that is as if contagious for those human beings who are weak in spirit. Unpredictable human behavior has detonated in clashes within various countries in the world, so I call you to pray for Spain, which is in danger; I invite you to pray for Costa Rica, its peace will not be the same. You, children, must keep praying for the whole world, for all people in the world; you must not falter or fear losing your life, but should fear losing your soul. Some of My children confide their hopes in My Protection and dismiss losing their material possessions or life, and they are wrong: Heaven’s protection is spiritual, it is for you to save your soul if you so desire. Beloved children of My Immaculate Heart, do not continue giving yourselves time to believe, to entrust yourselves to the path to which My Son has called you: entrust yourselves now! MY CHILDREN KNOW THAT PRAYER AND THE ACTION OF PRAYER GO HAND IN HAND. BE MESSENGERS OF DIVINE LOVE! I bless you with My Love, I bless you with My Heart. I love everyone with equal favor.